[Park Sang-seek] How to deal with a nuclear North Korea? North Korea says it has no choice but to become a nuclear state because it is the only way to defend itself from a nuclear attack from the US. This reaction may be a justifiable but not wise counterstrategy. Let us assume that the US would resort to nuclear weaponry even if North Korea attacked South Korea with conventional weapons. The world would not condone such a brutal response. I believe that world opinion is likely to support the use of nuclear weapons only if the US-South Korean combined forces failed (or were likely to fail) to repulse the invading North Korean forces with conventional weapons. This is exactly the plan of the combined US-South Korean forces. By becoming a nuclear power, North Korea has discarded this “privilege.” Perhaps it does not trust this Western strategy. Kim Jong-un may say that the only way to safeguard North Korea from the overwhelming US-South Korean combined forces is to make North Korea a nuclear power. Is the North Korean justification realistic? Instead of making the Korean Peninsula more peaceful, North Korea as a nuclear power would not only make the Korean Peninsula more insecure but would also result in North Korea becoming more isolated from the world and eventually becoming strangulated by global sanctions, particularly the UNSC sanctions. It has already suffered a serious decline in economic growth. So far, the North Korean leadership has been able to survive mainly because it has been able to feed its people barely above the survival level. Moreover, even China may reconsider its unconditional support, mainly because it benefits more from a peaceful Korean Peninsula than a highly unstable one. If the Kim Jong-un regime continues to maintain its anti-US-South Korea alliance strategy, it will have the opposite effect: The US-South Korean alliance will be strengthened. Sooner or later, Kim will realize that a conciliatory policy toward both South Korea and the US is wiser than any plot to create a rift between South Korea and the US. The idea of becoming a nuclear power seems to be based on the following reasoning: The US has no plans to abandon its strategy of providing a nuclear umbrella to South Korea. Therefore, North Korea has no choice but to have an equally powerful weapon to counter a US nuclear attack. It knows that US nuclear weapons are much more powerful than North Korea’s. But it also knows that the American people will never want to see their own territory attacked by a foreign enemy. Under this kind of threat, it is more likely that they would put pressure on their government to seek a compromise solution. Second, even if Kim knows that such a strategy is a dangerous gamble, he cannot think of a better means to force the US to come to the negotiating table. If the US comes to the negotiating table, North Korea is most likely to put forward a peace treaty (a treaty to bring about the formal end of the Korean War). This peace treaty would undoubtedly include the following: a declaration of the end of the war, the complete withdrawal of foreign fighting forces and the nonuse of nuclear weapons. If the above is correct, the US is more likely to resort to powerful means to counterattack North Korea instead of coming to the negotiating table. This means a complete economic blockade against North Korea. Kim should refresh his memory about the basic strategy of the US toward North Korea’s pursuit of nuclear weapons declared by the US defense secretary and the head of the National Intelligence Agency on April 28, 2017. That strategy is called the “maximum pressure and engagement policy,” and its stated aim is the unconditional denuclearization of North Korea. Despite this warning, North Korea still clings to two conditions for denuclearization. One is that the US nuclear threat be completely removed first. The other is that the US forces around the Korean Peninsula be withdrawn because these US forces provide a nuclear umbrella. Kim has made a mistake: By developing nuclear weapons, he has made South Korea and the US more determined to maintain the US-ROK alliance and its nuclear weapons. The best solution is negotiations between the US and North Korea toward the denuclearization of North Korea. The talks should be conducted according to the principle of the step-by-step and simultaneous implementation of both sides’ obligations. Unfortunately, North Korea is likely to lose all of its quid pro quo as long as it delays the negotiations. Recently, North Korea has been making conciliatory gestures, mainly because it is completely isolated from the world and suffering immensely from the UNSC economic sanctions. All members of the UN are prohibited from exporting most oil products and new kinds of industrial equipment and heavy machinery to North Korea, along with iron, steel and other metals, as well as from importing industrial equipment and heavy machinery. They are also required to repatriate North Korean workers. Because of these comprehensive economic sanctions, North Korea has been using the North Korean-Chinese border as a clandestine survival pipeline. Without China’s secret support, North Korea is bound to suffer an extremely severe economic crisis. As long as North Korea seeks more concessions from the US in exchange for denuclearization, the possibility of a peaceful solution to the nuclear issue will diminish faster than before. The US can wait longer, but North Korea cannot afford to do so. Under the circumstances, South Korea should be extremely careful not to violate the UNSC resolutions. Accordingly, South Korea should postpone the reopening of the Kaesong Industrial Complex until the nuclear negotiations between the US and North Korea result in an agreement. A simple and naive peace gesture from South Korea can hardly resolve one of the most difficult and dangerous issues in the world in the 21st century. Kim could use such a gesture as a means to prevent the North’s economic collapse or as a weapon to disrupt the close relationship between the US and South Korea. President Moon is willingly playing the role of mediator between the US and North Korea. I sincerely hope and pray that he will successfully fulfill this precious but risky role of peacemaker, always bearing in mind the abovementioned trap. My personal experiences and studies show that communists never give up or compromise on their objectives. Some scholars in the West argue that North Korea’s problem is that its leaders have a siege mentality, but I believe that they themselves created such a psychological war tactic and have been inculcating it in the North Korean people for the preservation of the Kim hereditary totalitarian system and for their antagonism toward South Korea. In view of this, the most important task for the Moon government is to persuade the North Korean leadership to abandon its archaic propaganda. I have always thought that if Kim Il-sung had not invaded South Korea in 1950, by now both Koreas would have achieved the final goal of the Korean people: reunification. 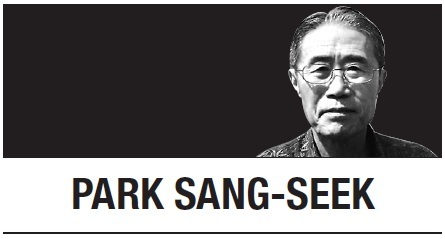 Park Sang-seek is a former chancellor of the Diplomatic Academy of the South Korean Foreign Ministry. -- Ed.